Hope Solo can't seem to stay of trouble. The U.S. Women's Soccer team goalie has been suspended for 30 days for a recent "incident." 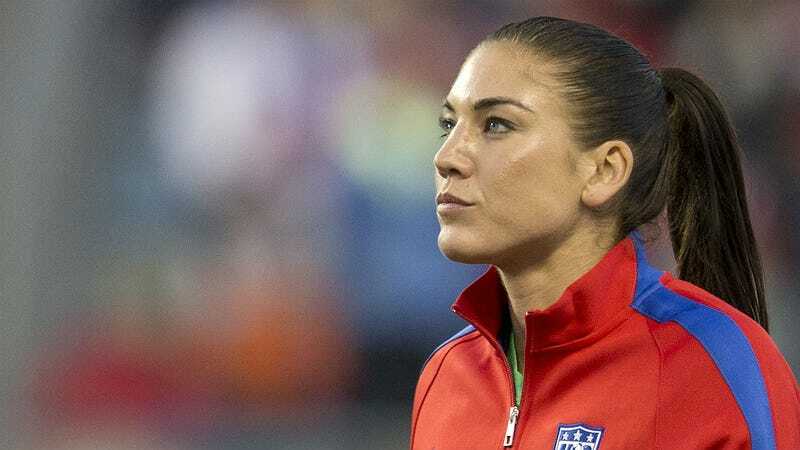 U.S. Soccer is cagey about exactly why she was punished but her suspension follows the arrest of her husband Jerramy Stevens, former Seattle Seahawks tight end, on suspicion of drunk driving, according to the Associated Press. Solo was in the car when Stevens was pulled over by cops in Manhattan Beach, California on Monday for driving without headlights. Solo, who wasn't arrested, is in town for the U.S. national team's training camp to prepare for World Cup beginning in June. Her suspension bans her from the team's forthcoming matches in Europe. Earlier this month, domestic violence charges against Solo for allegedly attacking her half-sister and nephew were dropped.